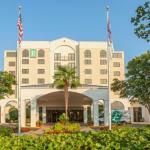 A free airport shuttle service spacious suites free breakfast and an evening manager's reception make it is easy to see why the Embassy Suites Hotel Columbia-Greystone is so highly rated among our guests. Each two-room suite at the seven-story 214-room Embassy Suites Hotel Columbia-Greystone is furnished with two flat-panel TVs and a mini-fridge microwave and wet bar. Free high-speed internet is available throughout the hotel. Guests rave about the free cooked-to-order breakfast that includes omelettes French toast meats potatoes biscuits and gravy fruit juice and lots more. They also enjoy the complimentary evening manager's reception featuring liquor beer and wine as well as non-alcoholic beverages and light snacks. The indoor pool and hot tub deliver year-round relaxation and fun. The business center provides two computers for public use as well as access to a printer scanner and fax machine. The hotel offers complimentary shuttle service to the University of South Carolina as well as other local businesses and attractions. A complimentary airport shuttle runs during set hours. The Embassy Suites is located just off I-126 for quick highway access. Riverbanks Zoo and Garden is just across the highway. Historic downtown Columbia is approximately five minutes away. Columbia Metro Airport is nine miles from the hotel.